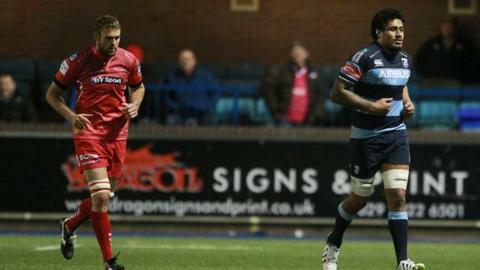 Cardiff Blues lock Filo Paulo and Scarlets' South African lock Joe Snyman will face a disciplinary hearing this week. The players were sin binned for fighting early in the second half of Friday night's Pro12 game, which Blues won 21-9. Both were cited by an independent citing commissioner for striking under Law 10.4 (a). Treviso prop Romulo Acosta also faces a disciplinary hearing this week. Acosta was red-carded for striking an opponent in his side's 48-0 defeat at Edinburgh.